Marine energy - what are the current options and technologies? This briefing sheet explains some of the current marine energy technologies,their challenges and potential for use, plus context and support mechanisms around them. Salinity gradients (osmotic power) – derived from salinity gradients occurring between areas of salt water and fresh water. The latter three marine energy sources described above are very much at the conceptual or Research and Development (R&D) stage so this briefing sheet focuses primarily on the first three forms of marine energy. From a theoretical perspective both tidal and wave energy devices offer the potential to generate significant amounts of energy. Some estimates indicate that total theoretical available energy from marine sources exceeds all human requirements (IPCC, 2011). In reality a combination of technological and economic challenges means that their deployment on any significant scale remains some way off. Although the use of the rise and fall of the tides, resulting from the gravitational pull of the moon (and to a lesser extent the sun), as a potential energy source goes back a long way, with several examples of small tidal mills for grinding corn both in Britain and France during the middle ages, the use of tidal power as a source of electricity is far more recent. The first major modern tidal power scheme was a 240 MW tidal barrage developed in France on the Rance Estuary in the 1960s. In the UK there have been several large scale proposals, notably the potential Severn Tidal Barrage and more recently the Swansea Tidal Power Lagoon, but to date none of these have been developed. This form of tidal power relies on the diurnal vertical rise and fall of the tides. 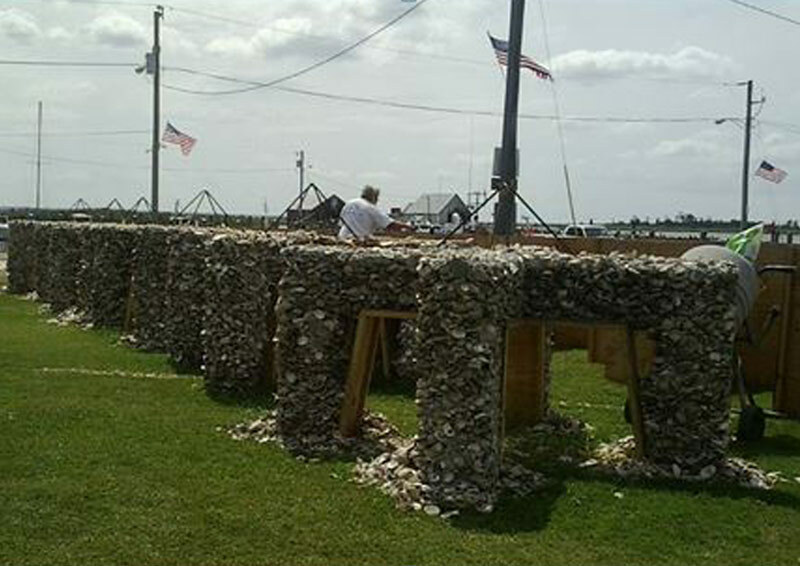 Typically a tidal barrage is constructed across the mouth of a river estuary which is used to trap the incoming tide. The most common form of tidal range scheme is referred to as ebb generation. On the incoming (flood) tide the water will pass through sluice gates in the barrage and then, at high water, the sluice gates can be closed trapping the water behind the barrage. As the tidal waters recede a head of water is developed between the high water level behind the barrage and the lower water level on the downstream side. This head of water can then be used to generate electricity using similar technology (i.e. turbine generators) to low-head hydro schemes (refer to ICE Hydro Power briefing sheet for further information). Other variations of tidal range scheme include flood generation (which uses the incoming tide to generate electricity) as well as two-way generation which generates electricity on both the flood and ebb tides. For tidal barrage schemes the average power output is proportional to the area of the retained water and the square of the tidal range. This means that the viability of a potential tidal range scheme is heavily dependent upon the tidal range and local topography. Environmental – Construction of large scale barrage across river estuary has potential for significant effects on local ecosystems. Although tidal range schemes have been around since the mid 20th century, the potential for tidal stream schemes is a more recent phenomenon. 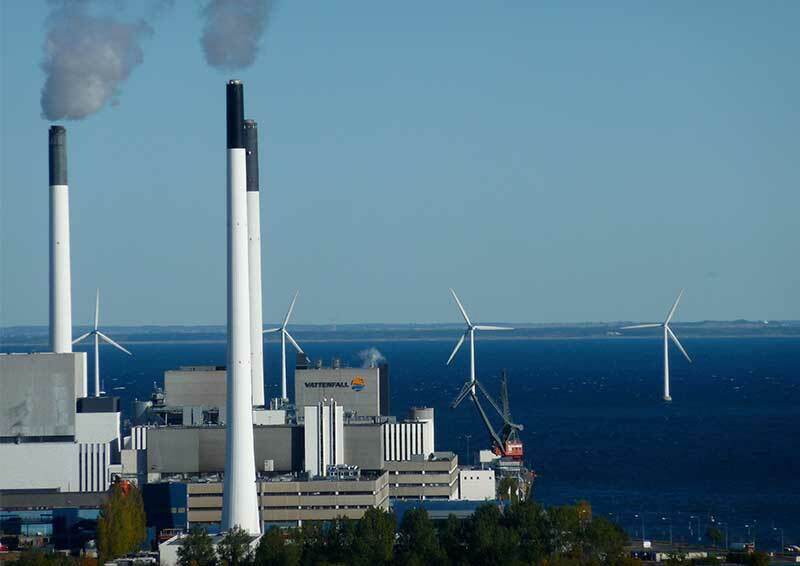 Instead of constructing a barrage which relies on the vertical rise and fall of the tides, it is possible to use underwater turbines which convert the kinetic energy from the horizontal flow of the tidal current to electricity. The submerged turbines can either be installed on a fixed structure anchored to the seabed or tethered to the seabed with an anchor system. The potential power output from a tidal current turbine is proportional to the swept area of the blades and the cube of the water velocity. This cube relationship means that the siting of tidal current schemes in areas with high velocity tidal currents is critical to the economic viability of the schemes. In the UK, which leads the world in terms of tidal current schemes, demonstration projects have been developed near Lynmouth in north Devon, Strangford Narrows in Northern Ireland and Pentland Firth in Scotland. Scalability – Although the UK has several very promising sites, viable sites are currently restricted to those areas with particularly strong tidal currents which constrains the potential to scale-up the technology. Many aspects of tidal stream schemes are similar to those for Offshore Wind Farms and Wave Power schemes. 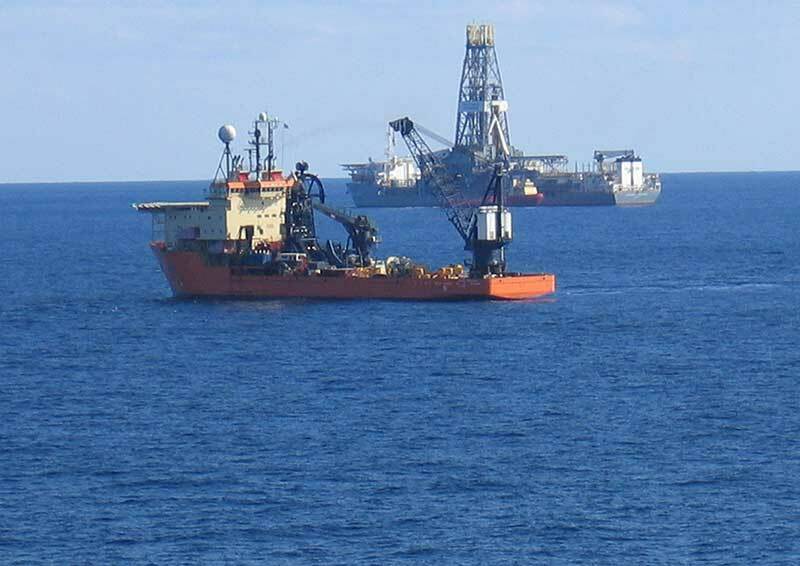 Interaction with marine traffic including fishing (generators and cables). 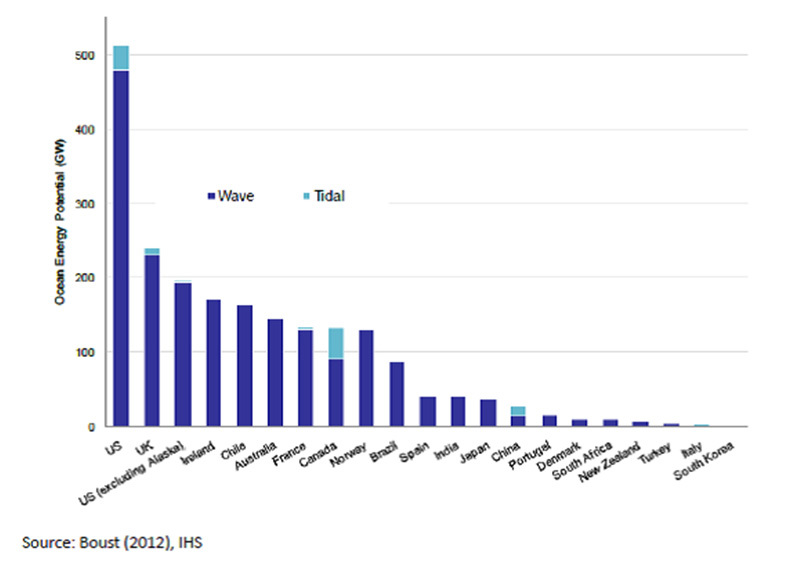 Globally it is estimated that there are currently over 1,000 wave device patents. A key advantage of wave power generation is that it is considerably predictable with an eight-hour certainty, as once waves have been created, they continue to transmit energy for some time and distance. 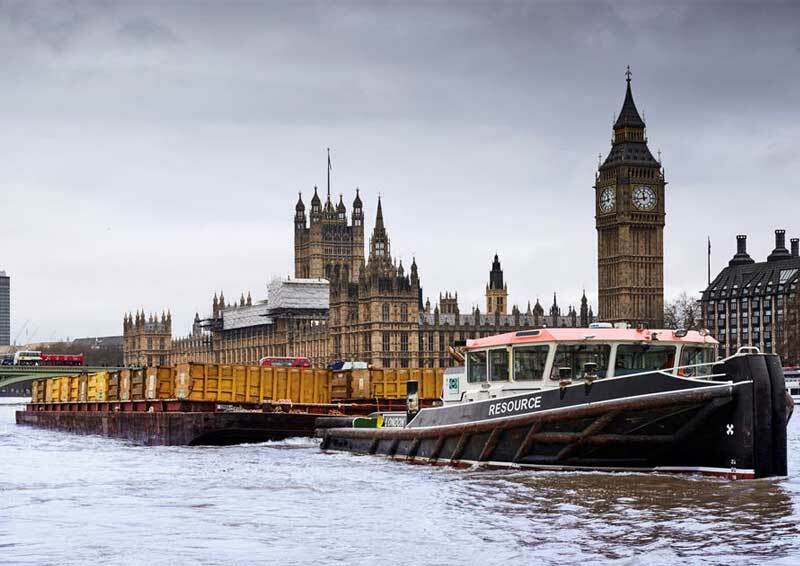 Attenuator – sits on the water and generates electricity through the movement of two adjacent arms as the waves pass. Point Absorber – floats and is connected to a base on the seabed. The motion of the sea makes the float rise and fall which creates electrical power in the base. Oscillating Wave Surge Converter – uses wave motion to generate energy through a moving arm connected to a pivot joint. 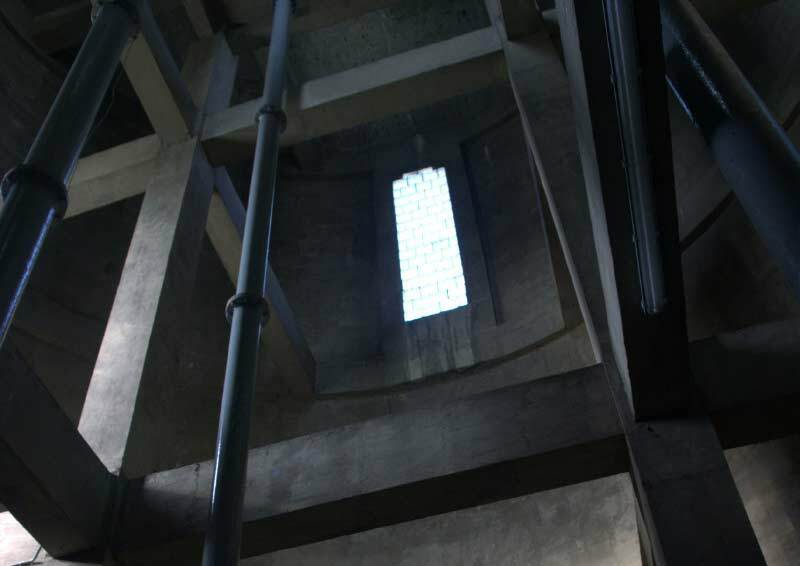 Oscillating Water Column – an enclosed and partially submerged column of air which is compressed with the rise and fall of the waves. This motion pushes the trapped air through a turbine. Overtopping/Terminator Device – waves rush into a submerged reservoir which passes through a turbine before being returned to the sea. Submerged Pressure Differential – situated on the seabed near to shore, creates energy by exploiting the pressure differential resulting from the rising and falling of the sea level. Bulge Wave – a moored rubber tube. Sea water enters the tube at the head and the is pushed through a turbine at the end where it returns to the sea. Rotating Mass – uses the waves 'heaving and swaying' motion to rotate a gyroscope or eccentric weight which in turn is linked to an electricity generator. The vast number of global patents indicates that wave power is an immature technology which is yet to breakthrough as there is no dominant design. In 2015 BVG Associates issued a report on the Wave and Tidal Supply Chain Development Plan. They identified that devices with a proven capability included Aquamarine Power (Oyster), Boosch-Rexroth, Fred Olsen (Bolt Lifesaver), Wello (Penguin) and Pelamis Wave Power. They also identified potential future technology as those by Albatem, AWS Ocean Energy and Seatricity. Need of financial support from government to make the technologies commercially viable. 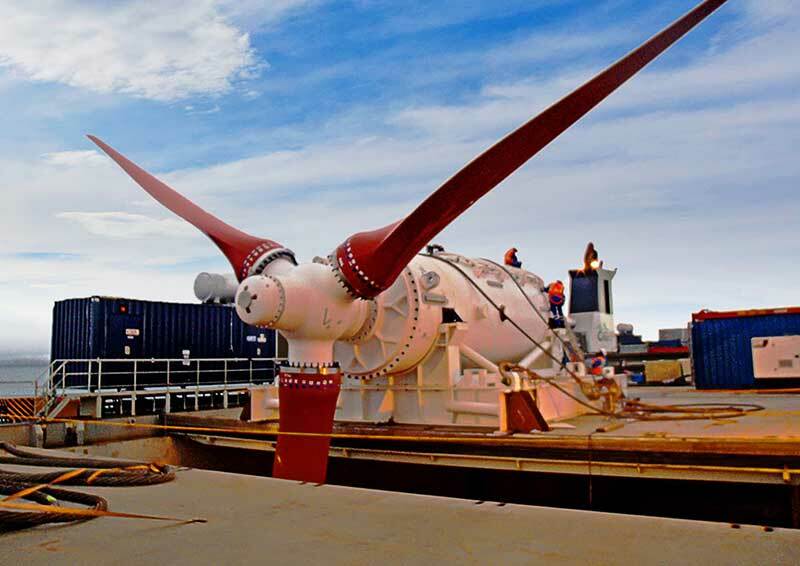 European Marine Energy Centre (EMEC) - Established in 2003, The European Marine Energy Centre (EMEC) provides developers of both wave and tidal energy converters with purpose-built, open-sea testing facilities. Based in Orkney, Scotland EMEC provides an ideal testing centre with its excellent oceanic wave regime and strong tidal currents. (Further information available at www.emec.org.uk). Wave Hub – Situated in the eastern extremes of the Atlantic Ocean, 16km off the north coast of Cornwall, Wave Hub provides one of the world's largest and most technologically advanced sites for the testing and development of offshore renewable energy technology. 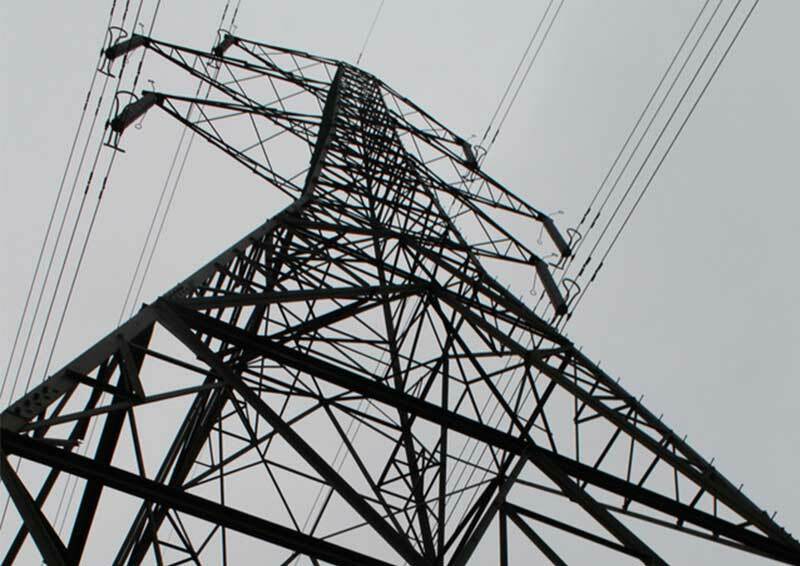 The site has four dedicated test berths with purpose built, pre-installed grid connection for up to 30MW export capacity. (Further information available at www.wavehub.co.uk). Offshore Renewable Energy (ORE) Catapult – The ORE Catapult centre is one of the UK's flagship technology and innovation research centres. The centre hosts open access shallow water testing facilities which provide a controlled salt water environment to trial and demonstrate new and innovative technologies. (Further information available at ore.catapult.org.uk/home). 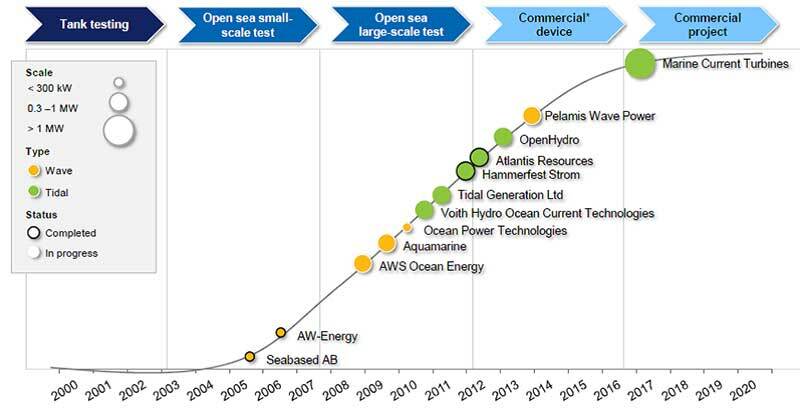 The test facilities already have planning consent and grid connection in place and therefore provide developers with a relatively straightforward option to test devices onshore and offshore in real ocean conditions. The UK is currently the world leader in marine energy, with around 10 MW of wave and tidal stream devices being tested in UK waters, more than the rest of the world combined. As an island nation situated in the north east Atlantic, the UK is subjected to strong wave and tidal regime but also benefits from a relatively shallow continental shelf all of which mean the UK is in an excellent position to capitalise on the potential benefits associated with Marine Energy. The figure below demonstrates the clear potential within the UK to generate significant proportions of our energy from marine energy. The UK Government has identified support bands to ensure financial support is provided to incentivise wave and tidal market development. Under the Renewable Obligation (ROC) regime, wave power received the highest level of financial support with five ROCs/MWh (under 30MW) and two ROCs, thereafter. With the change to Contract for Difference (CFD) (under the Electricity Market Reform) the strike price for wave and tidal has been set at £305/MWh. 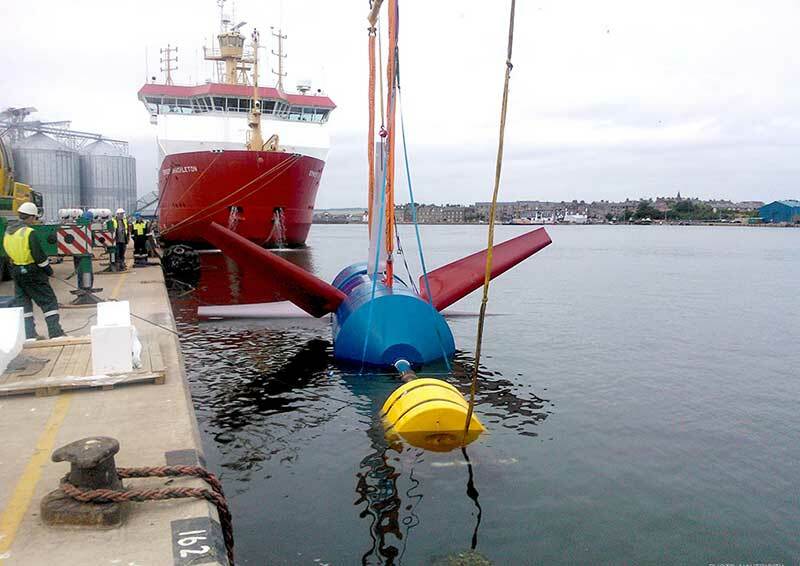 In 2013 Scotland established the Marine Renewables Commercialisation Fund (MRCF), to provide support for the wave energy industry in Scotland. The fund comprises of £18m. In a 2010 report, Ernst & Young identified that the cost of wave power could be reduced by a net amount of 70% by 2035 through learning and reducing underlying costs e.g. labour, metal and manufacturing. In their low cost scenario plan, the model illustrates that costs could be as low as £97/MWh by 2035 and £71/MWh by 2050. 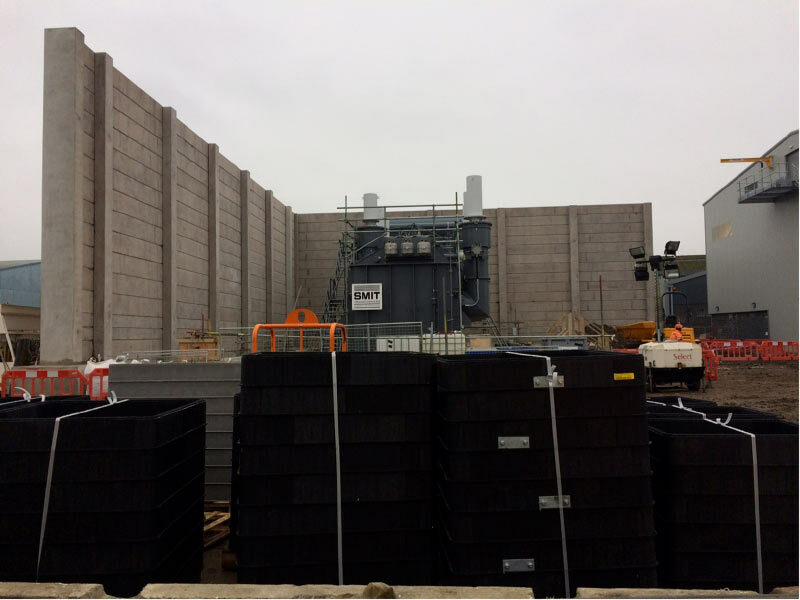 The UK Government is attempting to promote wave power developments in the UK through direct and indirect financial support mechanisms for innovation, manufacturing, testing and deployment of equipment. Marine Energy devices offer the potential to generate significant amounts of energy. Both wave and tidal power have a long way to go until full-scale commercialisation is realised, though tidal power is considerably closer to reaching commercial realisation than wave power. 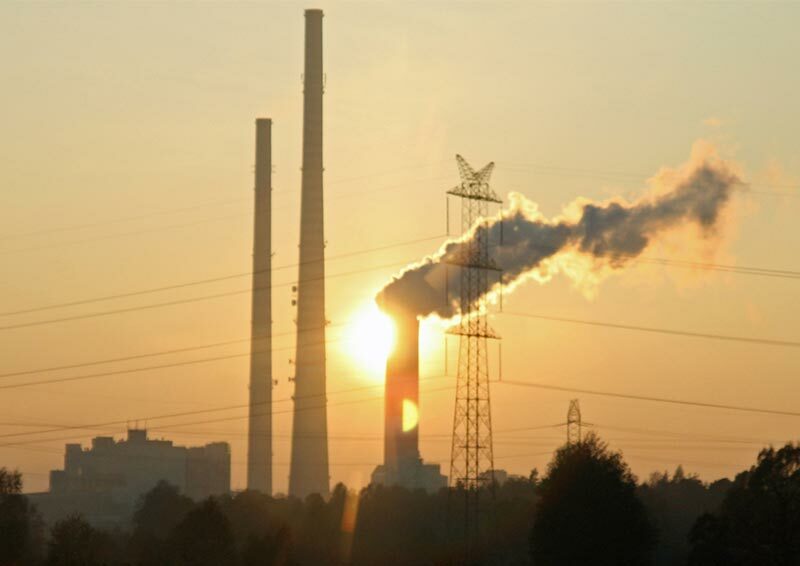 In both instances it is critical that the Government continues to support the development of technology in order for the UK to exploit this extensive and readily available energy source whilst increasing energy security and realising the 2020 and 2050 carbon reduction commitments.